Participants and their canine companions gear up outside Lynn Hall for the 2017 Dr. Skip Jackson Dog Jog, Saturday, September 23. It was a beautiful day Saturday, September 23, for a jog through campus during the annual Dr. Skip Jackson Dog Jog. 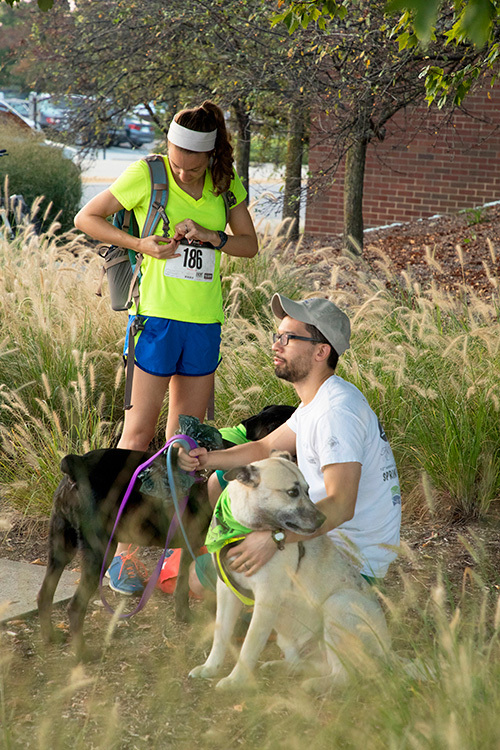 Homecoming events and construction nearby necessitated some alterations to the 5K's route, but it didn't dampen the enthusiasm of the approximately 180 faculty, staff, students, alumni, and community residents and their 88 canine companions who participated in the fun run/walk. With a shotgun start at 8:00 a.m., the racers were off and once again this year, joining in the fun were adoptable dogs from local area shelters. 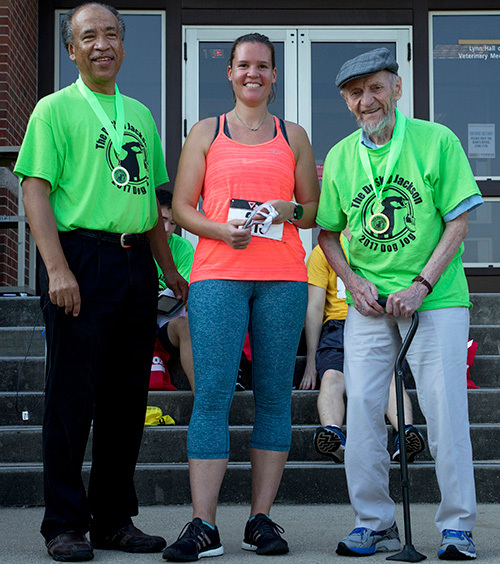 At the conclusion of the race, several awards were presented to participants including fastest male runner, which went to Dr. Blake Marcum, oncology resident in the Department of Veterinary Clinical Sciences, who finished the race in 13 minutes and 19 seconds; and the award for fastest female runner, which went to Kristen Mozeika, of the DVM Class of 2018, who completed the race in 19 minutes and 30 seconds, setting the fastest finish times in these two categories in the past five years. Additional awards included cutest dog, awarded for the pet belonging to John Walker, and fastest human canine pair, awarded to Chris Spears. For a complete list of awards and race times, visit the Dog Jog website at www.PurdueDogJog.com. A big thank you to Asia Fernandes, of the DVM Class of 2020, who served as the event coordinator, and to the many volunteers who dedicated their time and talent to make this annual event a success! Proceeds from the race go to the PetSafe Program and Priority 4 Paws (P4P). PetSafe is a community service offered by Purdue Veterinary Medicine to meet the short-term housing needs of pets whose owners are temporarily unable to provide care. Priority 4 Paws (P4P) is a shelter animal mobile care unit providing surgical services free of charge to Indiana animal shelters. 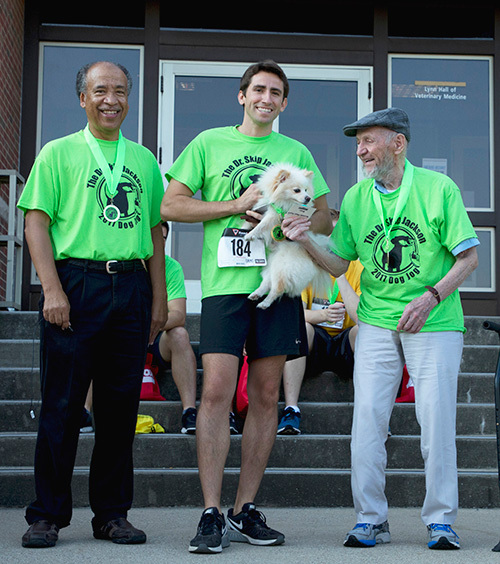 The event is named in honor of Dr. Horace (Skip) Jackson, professor emeritus of veterinary physiology and biochemistry, and is one of the longest-running traditions of the Purdue Veterinary Conference. Once again, Dr. Jackson was on-hand for the event, as he has been nearly every year since the first Dr. Skip Jackson Road Race was held in 1972. Professional photographer, Ed Lausch, was on-hand to photograph the event. Click here to view photos of the Dog Jog on his website www.LauschPhotography.com. At the login page, use the username "2017dogjog" and the password "september2017". Dean Willie Reed and Dr. Skip Jackson present Melissa Lewis with a medal for her second place finish in the women's division. Melissa completed the 5K in 21 minutes and 41 seconds. 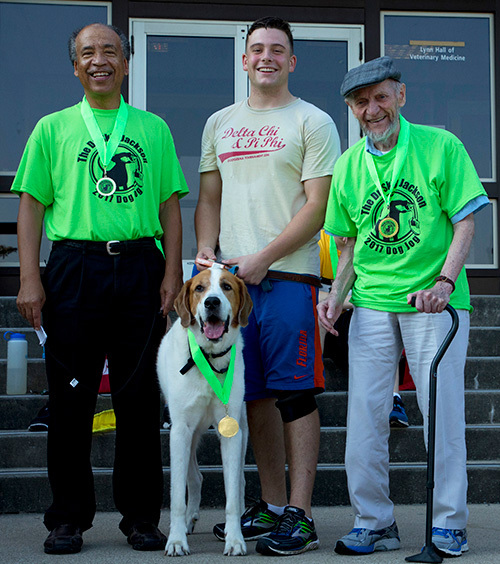 The award for having the "Cutest Dog" at the Dog Jog was presented to participant John Wagner. Danny Anderson received the award for having the "Largest Dog" at the 2017 Dr. Skip Jackson Dog Jog.